Welcome back. Some time ago, Vicki and I visited an art museum and dined in its very nice café. Our selected dishes were preceded by pieces of special bread, which Vicki enjoyed but I found too salty. My distaste for salt is probably due to my mother’s judicious use of the mineral. An exceptional cook, she leaned toward undersalting having once oversalted the entrée she prepared when hosting a guest of my father. Or maybe my dislike arose grabbing a bite to eat with friends during high school or when we were all back in town. My salt taste buds joined the witness protection program watching the guys reach for the salt shaker before tasting the already salty pizza, hamburger, hotdog or other fine-dining fare. 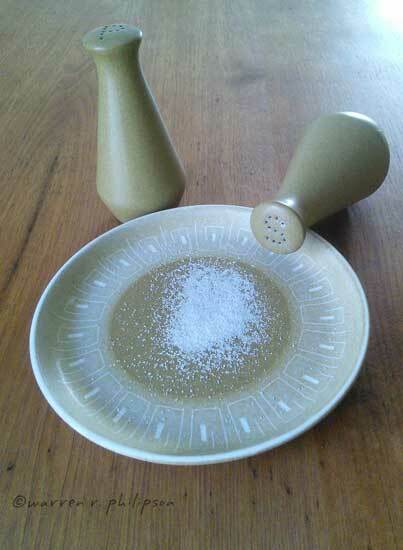 Of course, nowadays, with the concern about salt and high blood pressure, I’m grateful that I was never big on salt. And woe is us, there’s always research with a new concern about salt. Before I discuss one such study, I’d better review the latest guidelines to be sure we’re dining at the same table. The Dietary Guidelines for Americans 2015-2020 recommends that adults and children ages 14 years and older limit sodium, which is primarily consumed as salt (sodium chloride), to less than 2300 milligrams (mg) per day. That’s about 1000 mg/day less than our current average consumption, yet it’s the highest level likely to pose no health risk to almost everyone. The recommendation is based on evidence of a relationship between increased sodium intake and increased blood pressure. While there’s also evidence of an association between sodium intake and cardiovascular disease, that evidence is not as consistent as the evidence on blood pressure, a surrogate indicator of cardiovascular disease. OK, the new concern about salt? Weill Cornell Medicine researchers linked a diet rich in salt to an increased risk of dementia and cerebrovascular (brain and its blood vessels) diseases. If it makes you feel any better, the work reported thus far was limited to mice. Mice were fed food with 4% and 8% salt, the latter being comparable to the high end of human consumption. After eight weeks, magnetic resonance imaging of the mice showed significantly lower resting cerebral blood flow in the cortex and hippocampus, areas of the brain involved in learning and memory. The researchers also found the excess salt suppressed functioning of cells lining blood vessels to the brain (endothelial cells). This caused a reduction of nitric oxide, a gas the cells produce to relax the blood vessels and increase blood flow. After some mice were put back on their regular diet for four weeks, their cerebral blood flow and blood vessel cell function returned to normal. But mice that continued on the high salt diet developed dementia as measured by different criteria (object recognition test, maze test and nest building). The researchers performed additional experiments toward understanding the biological mechanisms linking high salt intake with dementia and preventing the suppression of nitric oxide, and work continues. I could relax if reducing sodium was as simple as not reaching for the salt shaker. Unfortunately, most of the sodium we eat comes from packaged, processed, store-bought and restaurant foods. A study of 450 adults from three U.S. metropolitan areas, for example, found sodium in processed and restaurant foods accounted for 71% of the participants’ sodium intake! Only 11% was added at home, either in cooking or at the table. 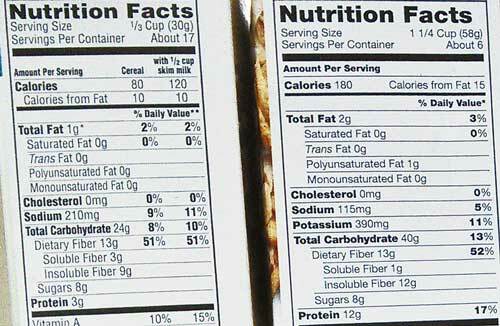 If you compare nutrition labels, such as the two cold cereals shown here, be sure to take the serving size (at top) into account. There’s some evidence that potassium intake can help balance the effects of sodium; however, overall diet, lifestyle and exercise are likely to be more important. One appendix in the Dietary Guidelines report is devoted to physical activity recommendations. So, join me in reading the labels. As we cut back on sugar, let’s try to do the same with sodium. And thanks for stopping by.